Patti Shank, PhD, author of the Make It Learnable series, is allowing our readers to read portions of her new books. This article comes from Write And Organize For Deeper Learning. How do you make content readable and legible? In my book I discuss 28 evidence-based tactics for improving content (for example, by improving the comprehension of it). In this article, I’ll show you how to do readability calculations using Microsoft Word. 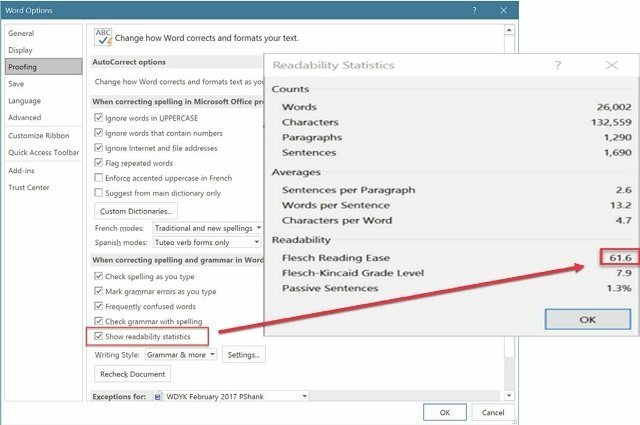 Later versions of Microsoft Word (typically under Word Options, in Windows) include readability statistics called Flesch Reading Ease (Figure 5.2). Depending on the version of Word you use, it may look slightly different from what you see below. In the versions of Word I have recently used, the readability statistics appear after you spell-check the entire document. Your version might do something different. There are other readability statistics and other tools you can use to check readability. Flesch Reading Ease is one of the most common readability scores, and it rates text on a 100-point scale. The higher the score, the easier the text is to understand. For best understanding with a typical audience, a score of 60 to 70 is ideal. I selected Flesch Reading Ease because it is the readability score Word calculates. But a lot of people use other readability scores. One readability score that comes up often is the SMOG Readability Formula, which estimates the years of education a person needs to understand the writing. SMOG stands for Simple Measure of Gobbledygook (delightful! ), and G. Harry McLaughlin created it to improve on other readability formulas. 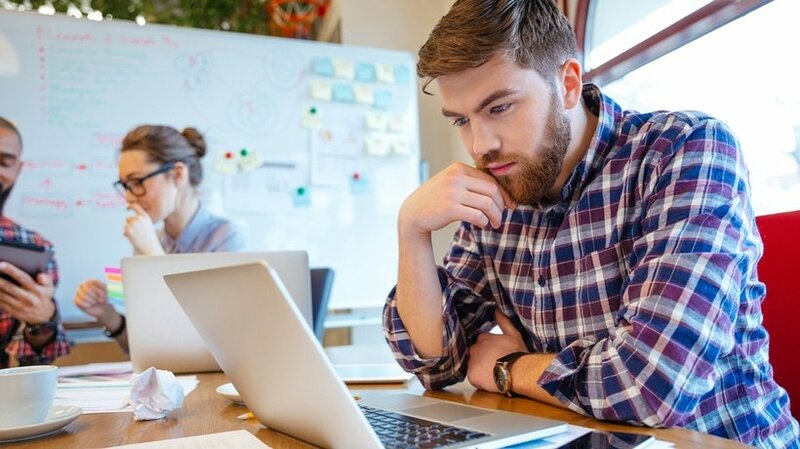 In the text you want to assess, select a group of 10 consecutive sentences near the beginning of the text, 10 consecutive sentences in the middle, and 10 consecutive sentences near the end. In the 30 sentences you selected, count every word of three or more syllables. If a word with three or more syllables is repeated, count each repetition. Take the square root of the nearest perfect square (perfect squares: 5x5=25, 6x6=36, 7x7=49, 8x8=64, 9x9=81, 10x10=100, 11X11=121, 12x12=144, etc.). If the count is 95, the nearest perfect square is 100 and the square root is 10. If the count lies between two perfect squares, choose the lower number. Add 3 to the number in Step 3. This gives the SMOG Grade. This is the reading grade of a person who can understand the text. Readability is just a start for figuring out whether people can understand your materials. Although I recommend testing readability, testing itself is not enough. Readability scores assume longer words are more difficult than shorter words and that words with more syllables are more difficult than words with fewer syllables. This may not be the case if the longer words and words with more syllables are familiar to your audience and the shorter words and words with fewer syllables are new to them. Readability scores are based on generic audiences. Your audience is not generic, so you need to use what you know about them. The National Assessment of Adult Literacy found that reading level is often below the last grade a person completed. The words someone uses and understands often depend on several factors, including demographics and their job. If you are writing training materials on putting out fires in the home, for example, the wording will probably need to be different for children and teens, homeowners, and property management staff. Training materials for fire professionals will use words other audiences are unlikely to understand. You cannot simply depend on readability formulas. Consider it a place to start. What does the audience know about this topic? How clear are the materials to someone who knows what you think they know? Can you test these assumptions with members of the audience? What words do audience members use in everyday language? Do most know what the words you are using mean? Will writing more simply make reading, application, and understanding easier? Readability may be important, but, by itself, it isn’t enough. Real readability means knowing your audience and writing for them. In the next part of the article we’ll talk about using readable type sizes. Stay tuned!